Whether you are a homebrewer, work for a nano, micro or regional brewery, the end goal is the same; you want to make a clean, consistent, flavorful beer. Throughout the beer brewing process, you need to monitor the ingredients and the reactions to ensure that the beer comes out the way you expect. Most of what you need to do can be measured, recorded, and tracked. The idea behind this is to find a beer that worked under the controlled parameters, and for you to be able to repeat the process and have the same excellent result. With all of this in mind, the beer process always starts with these key ingredients: water, malted barley, hops and yeast. Brewery Effluent: Where Does All That Rinse Water Go? While water may be the most basic ingredient, it is one of the most important. Beer is composed of 90-95% water. This means that the source of the brewing water greatly influences the end beer. Most brewers source water from their local municipality. Brewers depend upon the municipality providing water to maintain a range of acceptable standards for clean, clear water that can be heated and adjusted to their specifications. However, in rural areas, smaller operations may depend upon well water or other groundwater sources. This can cause the water characteristics to fluctuate more than a municipal water source. Regardless of source, it is important to monitor your brewing water. Brewers may want to adjust the mineral content, and the pH of the brewing water depending upon the specific flavors they want to accent. Traditional brewing styles are often dictated by the source and quality of brewing water. The ales of Burton Upon Trent are known for elevated gypsum content from the local water. The lagers of Pilsen, Czech Republic are known for the soft water of the region. For example, additions such as calcium sulfate can be used to lower pH, buffer malt enzymes and precipitate calcium oxalate during mashing. Another example is that calcium chloride is often used as a flavor enhancement, giving fullness to the final product. The table below gives you a good idea of what some well-known historical water profiles look like. For more information on water quality and brewing, check out this other blog post! (Table 1)Palmer, John J. How to Brew: Everything You Need to Know to Brew Great Beer Every Time. Brewers Publications, a Division of the Brewers Association, 2017. Check pH and hardness . A pH meter and probe are important at every stage of brewing. Hardness can be monitored with a basic test kit, photometer, or titrator. Other key parameters in brewing water are alkalinity (tested via kit or titration), and chlorine (tested via colorimeter, photometer, spectrophotometer, or test kit). Brewing water should be from a source that provides regular analysis showing major indicators of composition and content. If not, do the testing yourself! Be like the big brewers: taste, smell, and test your water regularly. Malted barley is a key contributor to the entire beer process. Malted Barley gives color to beer, and it provides a food source (fermentable sugars) for the yeast to do its job (to convert the sugars to CO2 and alcohol). It also gives a full bodied, sweet flavor to beer. The brewer selects the type of malt, and the amounts needed, in order to achieve the right balance for the finished beer. The main cereal grain in brewing is malted barley. Malting is a process that combines steeping the grain in oxygenated water, letting it sprout and then kilning it. This allows for certain enzymes to develop. Protein and starch modification begin during malting, but is arrested by kilning. The brewer can then activate those enzymes with hot water at a later stage. Unless the brewery is large enough to malt their own barley, brewers normally purchase malt from malt houses. Most malt houses are large scale and provide grain in rail cars to the biggest members of the industry. The barley is grown in the US Midwest and Canadian Prairie Provinces. Smaller scale brewers buy malt in 55 lb. bags from the same source. Many brewers are more likely to rely on the malt house to supply batch analysis of the malt they will brew with. Signs of a good malted barley are: protein content, carbohydrate content, and enzymatic capabilities. All of these factors help to convert the starches to sugar, and then the sugar to alcohol. Lab analysis will indicate how the malt will perform, how much fermentable extract it may yield, etc., but the final result will depend upon the operation of the brewery itself. The process of malting gives beer its golden color. The malt produced in this manner is called pale malt. The majority of the grain in any brew is pale malt. Brewers also use malted barley that is roasted or kilned to achieve a darker colored beer. In fact, brewers have been doing this for centuries. British brewers have been making red, brown and black ales with a blend of roasted malt. For example, crystal malt is an amber, full bodied malt that helped give Pale Ale its copper color. Chocolate and black malt are part of the makeup of Porter and Stouts. German and Belgian brewers have similar varieties of roasted malt for strong ales, black lagers, amber colored fest beers and all manner of seasonal brews. Make sure to use malt house batch analysis for malt. Monitor mash temperature with an at line or inline probe. This is of paramount importance for enzymatic conversion of starch to sugars (145-156⁰ F). If you do not have sufficient sugars, you will not yield sufficient alcohol. Check mash and wort pH (5.2-5.6) regularly. Hydrometer or digital refractometer readings indicate the amount of fermentable sugars available (SG or ⁰P). For the fully equipped lab, wort color can be monitored with a spectrophotometer (430 nm), as well as an important yeast nutrient, Free Amino Nitrogen (570 nm). Be like the big brewers, taste, smell, and test grain and mash regularly. Hops are flowering cones that grow on vines, and they provide bitterness and aroma to beer. They are grown mainly in the US northwest, the UK, and Europe. Hop vines that grow on a trellis can reach 12-15 feet in height during the year. Post-harvest, the cones are separated and dried. Hops can be shipped whole in bales or compressed into pellet form for easier storage. The majority of the brewers in the US purchase hops through brokers, getting specifics on varieties such as aromatic oil content, and bittering potential. Hop analysis, like malt analysis is mostly provided by the grower or broker, due to the intensive nature of testing. Hop cones contain bittering substances as well as aromatic oils, which are unique to each variety. 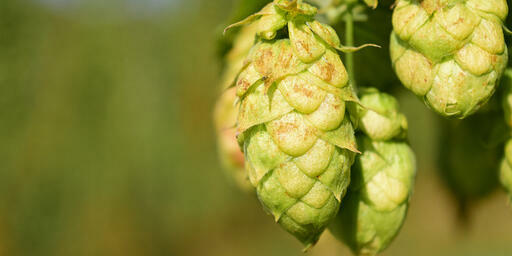 Traditional British and European hop varieties impart floral or spicy aromas to beers and ales. Recently, US growers have pushed the boundaries of aroma by creating uncommon scents. These include citrusy, fruity, piney and floral varieties. Brewers can change the profile of a beer by adjusting how much, and when they add hops. By increasing the amount of hops earlier in the boil, a brewer would impart more bitterness into the beer. 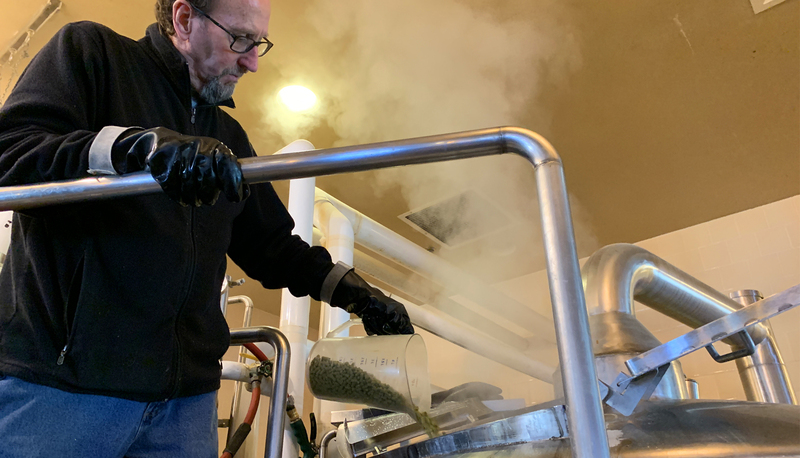 By adding hops towards the end of the boil, the brewer would allow the more aromatic qualities of the hops to come through. Additions of hops during the later stages of fermentation or storage accent aroma in a process called dry hopping. The more dry hops, the more intense the aroma in the finished beer. Use hop grower or broker crop analysis. A fully equipped brewery lab can monitor BU’s from the wort to the finished beer with a UV spectrophotometer (275 nm). Smell the hops before adding to a kettle or fermenter. For first use of a new crop, rub hops vigorously between hands and smell (like the big brewers do). Yeast is a single cell microorganism that does the bulk of the fermentation work. Yeast takes the sugars from malt, ferments them, and gives off alcohol and CO₂. The sugar in brewing is wort; the liquid fermentable extract from malted barley. Yeast will grow exponentially in the presence of wort and oxygen utilizing most of the sugars in the process. Most breweries collect yeast from primary fermentation. The brewer can then reuse or repitch the strain into later brews. Breweries of all sizes use the yeast strains grown and sold by commercial labs. Commercial labs will also house yeast strains for breweries that have a single preferred strain. Large breweries may keep yeast storage and propagation in house. The yeast strain that a brewer selects will have a profound effect upon the final flavor of the beer. The main choices are ale yeast (a top fermenting strain) and lager yeast (a bottom fermenting strain). It is good to keep in mind that even within each yeast strain, influential factors can vary. These factors include the performance, fermentation byproducts, and ethanol tolerance of the yeast. For example, ale strains generally have an estery, somewhat fruity profile. While lager strains have a dryer, more sulfury profile. Belgian and German Wheat Beer yeast strains add a further dimension of flavor and aroma. These have profiles that are more phenolic, spicy and estery. As with every step of the beer brewing process, yeast is temperature dependent. Yeasts fermented in warmer temperatures tend to produce more pronounced byproducts. Other flavors such as diacetyl (buttery) or acetaldehyde (green apple) occur in the first fermentation stages. Healthy yeast strains in a controlled environment can mellow out these flavors later on. Taste (it will be bitter) and smell the yeast slurry, check for healthy pink/tan color. Harvested yeast should be maintained at cooler temperatures (34-38⁰ F) before repitching. DO of the cooled wort is important to yeast respiration and growth (7-8 ppm). Check fermentation temperatures religiously. Fermentations are a crucial step in the development of beer flavor and yeast vitality. It is recommended to use a hemocytometer and microscope (400X capability) with the appropriate stain to monitor cell viability. This will also give you cell concentration for pitching. Brewing is a series of steps that combine water, malted barley, hops and yeast under specific conditions to make beer. Brewing takes place during a single shift, though several things have to happen. Brewing starts first with mixing the malted barley with hot water to form a mash. Then, run the liquid (wort) off from the mash into the kettle. In the kettle you boil the wort, add hops, and then cool the wort to a fermenter and add yeast. Once the wort starts fermenting, it is a "beer". Fermentation continues for days or weeks. Yeast will grow during this stage, giving off CO₂ and alcohol. After primary fermentation, the beer is cooled down for the storage or lagering stage for many weeks. After the secondary phase, beer is filtered or transferred to a tank for serving, bottling, canning or kegging. To start, malted barley is milled, making a grist. The grist is mixed into a tank called a Mash Tun or Mash/Lauter Tun with 145⁰ F - 156⁰ F water (approx. 1 barrel or 31 gal per 100 lbs of grist). This is a process called mashing in. The correct amount and temperature of the water is important at this point for the liquefaction of starch. Meanwhile, proteolytic and amylolytic enzymes in the malt convert proteins and starch in the grain. The end mash is allowed to rest for the greatest conversion of starch to maltose (sugar). After a prescribed amount of time, the brewer will heat the mash to 168-170⁰ F. This is a process called mashing off, and it denatures enzymes. Monitor the mash temperature and the pH. Elevated temperatures help to liquify the starch, allowing amylase enzymes to convert starch to sugar. While the optimum pH range (pH 5.2 - 5.8) buffers the enzymes. Remember, wort gravity is normally read once the runoff begins. After the mash converts, the wort from the mash bed is run off to the kettle. Screens in the Mash Tun hold the mash back while 168⁰ F water sprays over the mash bed to increase the fermentable extract. This process is called sparging. A controlled amount of water is sparged onto the mash. Thus, increasing the yield and keeping the mash bed from compacting. It is important during the runoff to keep the mash bed afloat, while running wort to the kettle. If the mash bed compacts too much, run off will actually stop. The mash bed has to be refloated at this point, using hot water pushed under the screens. This process is underletting; a procedure that reduces the yield and adds time to the brew day. Maintaining the proper amount of sparge, and keeping the mash bed afloat during the runoff means finishing the brew day on time. Check wort temperature and pH frequently. Keeping wort at an elevated temperature (with sparge water) will make it easier to start the boil in the kettle. The pH of wort should mirror the pH of the mash (pH 5.2-5.6). Wort color can be assessed with a spectrophotometer (430 nm). 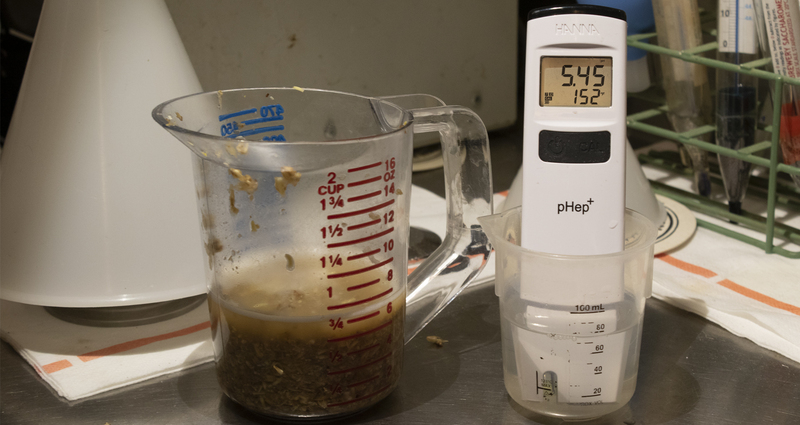 Gravity readings with a refractometer or hydrometer indicate the amount of sugars in the wort. Readings at the beginning of the runoff (first wort) and at the end of the runoff (last sparge) tell you how effective the process has been. It will sterilize the wort. It will also promote haze causing proteins to coagulate (hot break). It will impart bitterness from hop additions. The yeast can only ferment the wort once it is cool. The cooling of the wort means that you will have a sterile growth media for the yeast. Unsterilized wort could cause bacterial and wild yeast to grow in the wort. Unintentional growth leads to souring and off flavors. Proteins can combine with tannins from the malt husk in finished beer to cause haze. A portion of these proteins settle at the end of the boil. Excessive protein can also make filtration difficult, blinding cellulose filter sheets. Boiling isomerizes 𝛼-acids in hops to iso-𝛼-acids, the bittering compound in beer. The amount of hops and the length of the boil increase the isomerization of 𝛼-acids and the bitterness of the beer. Constantly monitor wort temperature. The boil must be maintained to impart hop bitterness, clarify the wort and achieve sterility. Gravity readings with a refractometer or hydrometer indicate the amount of sugars in the wort. Wort color can be assessed with a spectrophotometer (430 nm). After the boil, wort is cooled to yeast pitching temperature. Wort is also oxygenated at this point to between 7-8 ppm. Some lagers start fermentation at 48-50⁰ F and then rise to 55⁰ F. While some ales are more likely to start at 60-64⁰ F and rise to 68⁰ F. Some Belgian yeast strains perform best at much higher temperatures (72-80⁰ F). Much of the behavior of yeast is also strain dependent. Meaning, some strains produce off flavors within normal fermentation temperatures. In other words, brewers need to choose a strain that works for their system. Yeast will grow 8-10 times its initial volume. This should leave enough yeast after the primary fermentation to reuse in the next batch of beer. Yeast is a living organism with a shelf life and should be repitched on time. Keep yeast cool (34-38⁰ F) in a clean stainless container with a lid between brews. In general, warmer fermentation temperatures will decrease fermentation time. Yet, there may be yeast byproducts produced at these temperatures that are unpleasant and hard to remove. Wort is changed to beer during fermentation, with the yeast utilizing sugars, giving off alcohol and CO₂. Yeast can also produce other byproducts such as: acetaldehyde, sulphur compounds, and higher alcohols. The yeast can reduce some compounds in the beer, but others stay in the beer and can carry through to the finished product. Yeast growth and fermentation will slow after a number of days. The ethanol produced by yeast has the effect of slowing yeast metabolism, along with osmotic pressure of the beer and the fact that most of the fermentable extract has already been taken up by yeast. Temperature is vital and should be checked daily. If the tank gets too cold (40-42⁰ F), the yeast will become dormant, ceasing to ferment the sugars in the wort. If the tank gets too warm (+80⁰ F), bacterial growth may occur causing various off flavors. Gravity will decrease as yeast converts sugars to alcohol. Gravity should be read daily, showing the progress of the fermentation, usually with a time/temperature chart. When the beer attenuates properly, the apparent extract reading (AE) indicates that primary fermentation is near completion. Micro tests for yeast purity are recommended. Secondary fermentation takes place in the fermenter after the tank is cooled to storage/lagering/conditioning temperature (34-45⁰ F). 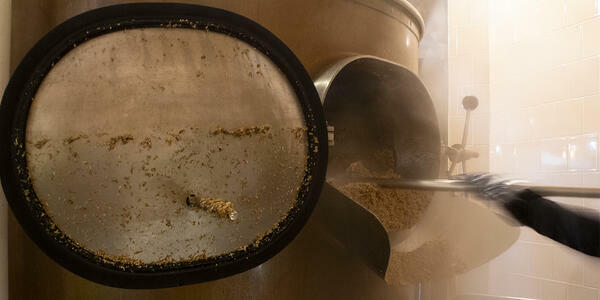 The bulk of the yeast is removed at this point or the beer is transferred into another tank leaving the yeast behind. Colder temperatures promote haze causing proteins and tannins to floc out, along with much of the remaining yeast. This phase can take weeks, depending upon the yeast strain, and the condition of the beer after primary. Hops may be added at this stage in a process called dry hopping. Fresh hops with a high oil content will add aroma to beer over the weeks that they are in the beer. An addition of process aids used for clarity can happen at this stage. Any process aids are filtered out before packaging. Carbonation levels increase when tanks are sealed or CO₂ is fed into the beer. Standard levels of carbonation are measured in volumes (2.3-2.8 vol), where 1 volume is equal to 1 liter of CO₂ at 1 atmosphere in 1 liter of fluid. Temperature will influence the settling process. The colder, the better for most applications. Check your temperature frequently. CO₂ levels should be adjusted for final packaging. 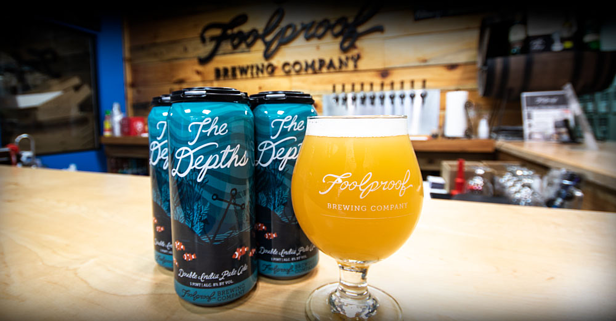 Turbidity measurements are helpful for hazy beers and important for filtered beers. Check your DO readings; they indicate how well beer will hold up once in the bottle or can. Final Gravity (Apparent Extract) should be taken at this stage. The final step in brewing is packaging, getting the beer into the container that the public will purchase. Packaging is labor intensive with more staff per shift than other brewery operations. Rudimentary packaging lines move beer through inline fillers and average 50-70 cases/hour (24 x 12 oz case). 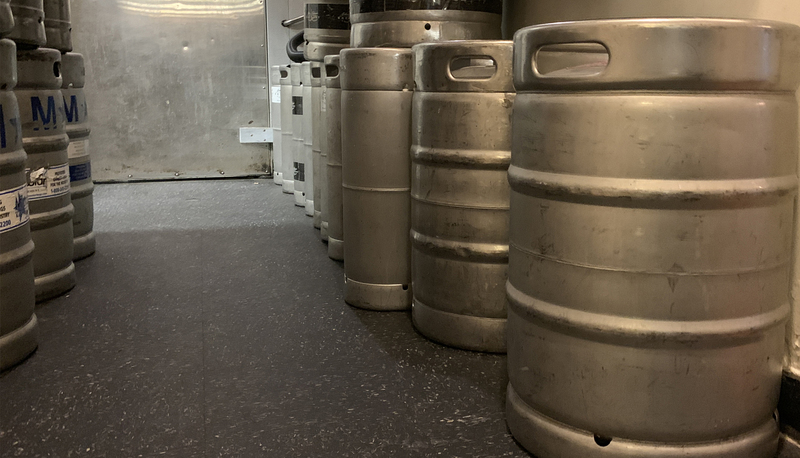 Single head keg washer/fillers produce 10-12 kegs/hour (15.5 gal keg). Larger lines pack hundreds to thousands of cases/hour. Similarly, large keg lines have multiple cleaning and filling heads that can turn out hundreds of kegs per shift. For any application in packaging, keeping the DO levels as low as possible is key to longer shelf life. Beer transferred, centrifuged, or filtered into a tank (brite beer tank) that will be packaged should be purged with CO₂ to reduce any oxygen pickup. Efficient packaging lines will purge cans, kegs or bottles with CO₂ before they are filled under pressure. DO of beer from brite tank and package are of primary importance. Packaged beer needs to be 40-50 ppb for shelf life, 5-25 ppb for breweries with good oxygen control. CO₂ level from the brite tank and the package. Numbers should not vary greatly between the two. Micro testing of the finished package is recommended. Anaerobic spoilers can take weeks to manifest off flavors. Final gravity should be tested. AE should match levels taken from secondary fermenter. pH of final package should be taken. Every brewery has to deal with effluent, the waste beer, yeast and rinse water from cleaning that goes down the drain. Most large municipalities have treatment plants that can handle the pH, amount of solids and oxygen demand that comes from brewery effluent. Brewing operations in rural communities may need to treat their effluent before it can be released to the sewer. A steady stream of acidic beer or yeast at one time can shock the system for smaller treatment plants. In some case, brewers must keep effluent segregated in a holding tank. Then, releasing the effluent only when more neutral pH and Total Dissolved Solids criteria have been met. Very large breweries may incorporate a treatment plant in their brewing operations. 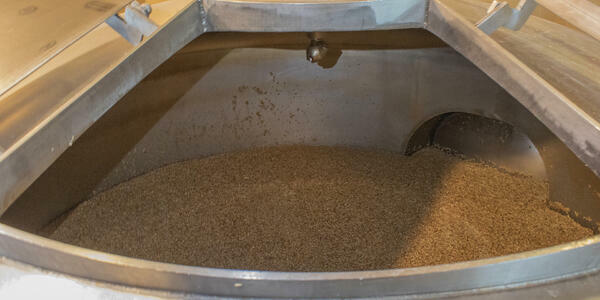 The main byproduct of brewing is spent grains from the mash. Luckily, spent grains are in demand for silage and cattle feed. Although the brewer has extracted as much sugar and protein as needed for beer, the residual amounts of protein and sugars make spent grains attractive to farmers. 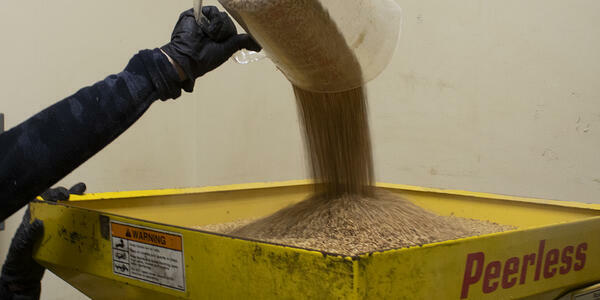 If your volume warrants it, having spent grains tested for protein content can increase its value. After the spent grain is removed from the Mash Tun, there are minute amounts of grain left over. These are usually rinsed to the drain. Normally, this will not be more than a handful of grain. The largest charge to the sewer is from the kettle. After the wort has been whirlpooled and cooled to a fermenter, there is a large amount of what is called trub left in the kettle. Trub is coagulated protein from the wort, formed during the boil and can represent as much as 6.0% of the volume of the wort. The trub can have a moisture content of +/-80%, making it relatively easy to dilute with water and spray down the drain. However, trub also represents very high BOD (biological oxygen demand) values in wastewater. Larger breweries may sidestream the trub and pump it to a holding tank to be blended with waste yeast. Waste yeast and trub are high in protein content and farmers will pay a premium for the blend that is further mixed with spent grain. pH, COD, BOD, TDS may all be required tests. You may be required to send all effluent to a holding tank that can only be allowed to discharge if the above-mentioned parameters are within range. Sidestreaming heavy solids such as waste yeast and trub may also be necessary to comply with local regulations. Waste yeast presents the biggest challenge for disposal in the cellars. Yeast grows to eight times its volume once introduced to wort and this produces enough yeast to harvest and repitch into future brews. There is more yeast than is needed to repitch from one brew to the next. So, much of the batch is washed down the drain at some breweries. Smaller amounts of yeast settle out during secondary fermentation. This yeast will also get rinsed to the drain. Where required, yeast is sidestreamed. Tanks get cleaned in place (CIP), normally with a 1.5-2.0% alkaline solution, and then get rinsed. The dilute rinse goes to the sewer unless it is required to be held until the pH value is brought down. The important measurement parameters are the same as for Rinse Water from the Brewhouse. See above for the information. Bottling and canning lines demand a lot of water for rinsing and sanitizing. During operation, a constant spray of water at various points of the conveyor lines and the rinser/sanitizer for bottles or cans is used. Packaging line rinse water generally does not fall into the same category as brewery effluent. Yet, sewer discharge fees are sometimes based upon total water usage. Now that we have talked about the beer process, let's talk a bit more about the types of beer available. The range of beers produced is vast and growing. Traditionally, beer in the US was golden, cold, and carbonated. Beers in the UK and EU have always had a mix of golden and specialty beers that range from amber to black. Flavors of the specialty beers are more pronounced, with hop aroma and bitterness coming through. Luckily, much has changed in the US in the last few decades. People have discovered flavorful beers. Micros and regional brewers now make a bewildering array of styles. Many styles are influenced by the classic brews of Europe and the UK. The American twist on the classic styles seems to be to take the style further, add more malt, more hops and create new categories. They should test for parameters that are going to affect the quality of the beer. The results should be repeatable and reliable. The instruments should be user friendly. They should fit your budget. The next step for laboratory equipment should include more advanced instrumentation, principally to include packaged product. Beer in bottles, kegs and cans has a shelf life that needs to be longer than beer produced and consumed at a brew pub. Brew pubs, and tap rooms have the advantage of being able to sell their beer directly to customers. Under those circumstances, a batch of beer can be gone in a few weeks. Packaged beer may need to be on the shelf for months. But testing your beer doesn’t have to be! The options for testing brews are as diverse as the different types of beer. For help in choosing the best option for your testing needs please contact us using one of the channels below. Craving more info? Check out these other Beer Blogs! How Does Your St. Patty’s Day Beer Measure Up? Tim Morse has been brewing for four decades, from brewpubs and micros to regional breweries. Mr. Morse has a Brewing Degree from Siebel Institute of Technology and received the Large Brewpub Brew Master of the Year at the Great American Beer Festival, 2000. As the son of a Food Scientist, Mr. Morse continues the tradition of making a living messing around with yeast.